From A-Z we help you understand the industry and what you are getting for your money. A trade show exhibit that fits into a 10' wide by 10' deep space at a convention hall. This is the most common trade show display size and a great option for small to medium range companies where a professional presence is needed on a budget. See our selection here. A trade show booth that fits into a 20' wide by 10' deep space at an exhibit hall. Most popular among medium to large companies that want more visual impact. See our selection here. A trade show display that fits into a 20' wide by 20' deep space at a convention center. Most popular with enterprise level brands that need to project industry prominence. Often custom solutions like Truss Displays, for exhibitors that may be sponsoring an event and require space for demonstrations and interactive accessories. See our selection here. An international term for a trade show display that fits into a three meter wide by three meter deep space. Also known as a 10 x 10 display. Audio/visual equipment such as monitors, DVD players, projectors and computers used to demonstrate products and services to trade show attendees. Accessory items for trade show display rentals and exhibits, such as retractable banner stands, display counters, display kiosk workstations and literature holders. An off-site warehouse, where exhibitors' show materials are stored until show setup begins. Items are shipped to the advanced warehouse a few weeks before the start of the event. A show contractor then transports the items from the advanced warehouse site to the show site. Advanced warehousing is usually much less expensive than direct-to-show shipping, but requires advanced planning to meet the required delivery windows. A custom portable display for trade shows with booth graphics and structural support for computers, monitors, shelving and locking storage cabinets. People who go to a trade show event, fairs and expos to visit booths and gather information on or purchase products and services. A light source that illuminates translucent trade show display graphics, fabric or other materials from behind. Booth structure that makes up the rear of the exhibit. Often a 10x10 trade show booth. Hanging signs or display graphics printed on fabric, vinyl or other material for temporary use. A portable printed graphic with a base or pole stand to create an upright banner display. Banner Stands are available in various heights and widths. See also called Pull Up Banners and Retractable Banner Stands. An area made up of one or more standard units of exhibit space. Exhibiting companies erect trade show displays within the booth space. Also called a Stand at European fairs and expositions. Common sizes are a 10x10 Booth, 10x20 Exhibit or 20x20 Exhibit. The amount of space assigned to an exhibitor on the trade show floor. Measured by square footage. A number assigned by show management to identify an exhibitor's floor space. Also known as Stand Number at European fairs and expositions. Staff members assigned by an exhibitor to work in an exhibit. These often consist of "Sales-ready" and informed members of your team that are comfortable talking with visitors and generating qualified leads. This also includes 3rd party teams hired for promotion, often known as "Booth Babes". The dimensions of the floor space contracted by an exhibitor. Usually sold in 10' x 10' increments. A 10x10 trade show booth is often the smallest size, up to a 20x20 exhibit size and larger. An area made up of one or more standard units of exhibit space. Exhibiting companies erect trade show displays within the booth space. An area used for storage of equipment and supplies (such as shipping cases) during a trade show or event. A boneyard may have its own dedicated space in the exhibit hall, or it may be located on an unused portion of the show floor. The process of assembling an exhibit display before the show starts. An international term for Installation. Also known as Booth Set-Up. A smaller modular piece of a larger exhibit. For example, a custom modular display island often has a 10x20 exhibit or 10x10 display breakdown. This allows the exhibitor to use different pieces of an island display for different sized booth spaces. Small, lightweight and portable displays made from metal or mesh with pockets to hold marketing collateral. Also called Literature Rack or Literature Holder. Flooring that goes under trade show displays. Trade show flooring is available in many different colors and styles--such as interlocking tiles and rollable segments-- and materials, including sustainable, recycled and recyclable substances. See also Trade Show Flooring. Certified Trade Show Marketer! See www.CTSM.com for details. The process of replicating colors in trade show display graphics for consistency and accuracy. Often used to complement a company's corporate branding. A freight transportation company which consolidates properties of several exhibitors into one shipment bound for the same destination. An educational program including guest speakers and informational sessions for event attendees. Usually coincides with a trade show event or expo with booth space for exhibitors. Also called a Congress in Europe. A component in large island displays in which to hold private meetings and presentations to trade show attendees. A gathering of professionals in a given industry that meet to attend educational conference sessions and visit vendor trade show display booths. A large facility with ample booth space for trade show displays. A booth space which is open on two sides at the intersection of two aisles on the trade show floor. Also known as Corner Stand or Open 2 Sides at European fairs and expositions. Sizes can vary from a 10x10 trade show booth to a 10x20 exhibit up to a 20x20 exhibit and larger island display. An exhibit kiosk which attaches to pop up trade show booths. Exhibit kiosks add functionality such as monitor mounts, display counters and storage. A display designed and built from scratch to meet the specific needs of an exhibitor. Custom exhibit design begins with determining the exhibitor's trade show objectives. In European terms, a Custom Exhibit is known as a Custom Stand or Freebuild. Exhibits constructed with interchangeable components designed to be set up in various arrangements and sizes. A modular trade show display can be customized to fit the exhibitor's needs. Common sizes are a 10x10 trade show booth to a 10x20 trade show booth up to a 20x20 exhibit and larger. Lightweight displays designed to be compact and pack into small shipping cases that can be transported by one person or shipped via FedEx or UPS. Portable exhibits can be customized to fit the exhibitor's needs. Sizes run from a 10x10 booth, to 10x20 exhibit up to a 20x20 exhibit and larger island displays. A custom modular display system that blends the look, feel and features of custom displays with the benefits of lightweight, portable exhibits. Popular sizes come in a 10 x 10 trade show booth, 10x20 exhibits and 20x20 island displays on up. Digital signage technology that allows exhibitors to showcase videos, images, text and even live TV together in perfect balance to communicate your message with impact. See our selection. The process of taking apart a trade show booth and packing it into shipping cases for transportation. Also known as Tear-Down. A small component of trade show booths with surface area on top to display products and literature or perform computer demonstrations. Display counters often feature a locking door and internal shelves to store materials. A small structure within a trade show exhibit, which often features a computer workstation(s) with multimedia capabilities. Also called Workstations at European fairs and expositions. Another term for booth space or the area of the show floor an exhibitor occupies to build an exhibit display. An international term for a trade show booth. An electrical distribution box that houses multiple outlets in one location. Graphics that are printed onto a rigid or flexible/rollable material using a flatbed UV printer. Ink is sprayed directly onto the material, then cured with ultraviolet light. Direct-print graphics are very cost-effective, durable, and fade-resistant. A process where exhibitors' items are shipped directly to the show site for a pre-scheduled delivery. Direct-to-show shipping is much riskier (and expensive) than advanced warehousing, since items must be delivered on a specific date, within a very specific time frame. A multi-level trade show exhibit with two stories. "Dots per inch" referring to the resolution or sharpness of printed trade show booth graphics. Also known as material handling, drayage is a term used to describe services performed by a contractor (usually hired by the event's sponsor) and involves several steps: 1) transportation of your exhibit materials from the receiving dock to your assigned booth space, 2) removal and storage of shipping crates/cases once display setup is complete, 3) return of shipping crates at the conclusion of the event, and 4) loading materials back onto a carrier's vehicle for outbound shipment. Graphics that are printed onto fabric using a combination of a grand format printer and a heat press. Graphics are printed, then transferred to fabric while running through a 400°F heat press. Since the heat press is so hot, the liquid ink becomes a gas, and it's sublimated into the fabric. Dye-sublimated graphics are very crisp and vibrant. "Exhibitor Appointed Contractor" forms designate a third-party contractor to perform work on the exhibitor's behalf. Often associated with trade show exhibit installation and dismantle labor services. A custom modular display system featuring aluminum extrusion, large trade show display graphics and unique lighting. An American manufacturer of sustainable exhibits and environmentally-friendly custom modular trade show display systems and custom portable exhibits. See also Green Displays. A diagram used to designate placement of electrical outlets in the booth space of a trade show exhibit. Scaled drawings depicting the front and side views of an exhibit display. Building upon the best features of the European patented design and the most sophisticated magnet technology to create Energy X – an easy and versatile pop up display system available. Fabric displays supported by a lightweight aluminum frame covered with large, stretch fabric display graphics. A file type for 2D vector trade show booth graphics. EPS files are supported by several drawing programs and graphic editing applications. Vectored files are able to be enlarged without loss of resolution, which is ideal for large-format trade show display graphics. Custom modular trade show displays using aluminum frame components. An organization tool, often web-based, in which trade show managers can keep track of exhibit booth inventory, schedule trade show shipping, organize trade show calendars, save important booth documents and manage budgets. Face-to-face promotional experiences between customers and companies. Event Marketing includes a trade show event or outdoor events and often involves an exhibit booth. A contractor hired by an exhibitor to perform trade show services independently of show management appointed contractors. Also called Independent Contractor or EAC. One of many terms for a trade show display. A preliminary idea for a trade show exhibit, often involves a hand sketch of the display. A custom exhibit design is based upon the exhibitor's trade show objectives. Exhibit design is often related to a custom display but is also applicable to a modular display and portable exhibits. Company responsible for exhibit design and fabrication of exhibit booths, including custom display systems, custom modular displays and custom portable exhibits. A company which specializes in the design and production of trade show displays and booth graphics for exhibitors. An exhibit house often offers associated logistic services such as shipping, labor and storage for trade show exhibits. A person in charge of a company's exhibit program. An area made up of one or more standard units of booth space. Exhibiting companies erect trade show displays within the exhibit space. An international term for trade show exhibit. Also known as a trade show event or expo. Also called an Exposition in Europe. A company who contracts with show management for booth space at a trade show, in order to interact with attendees to sell products and services. A package of information with contains all rules, regulations and forms relating to a trade show, provided to exhibitors by show management. Also called Service Kit or Exhibitor Services Manual. Also known as exhibition or trade show. An American manufacturer of custom modular displays featuring panels, aluminum extrusion and internally light display frames. Also known as exhibition or trade show. Expo is the short form. A trade show exhibit system constructed with aluminum posts as the main structure. Extrusion systems are often infilled with large-format, fabric trade show display graphics. An exhibit booth comprised mainly of stretch or tension fabric and a lightweight aluminum structure. Can be printed with large-format exhibit graphics. Trade show graphics printed on stretch or tension fabric. Can be translucent or opaque. Green or eco friendly display graphics use water-based inks and fabric made from recycled plastic bottles. Fabric graphics also pair well with a truss trade show display or hanging trade show signs. Fabric displays which use a pop up trade show booth frame covered with fabric booth graphics, often attached to the frame for very easy set-up. Another term for Event Marketing or promotional experiences in which customers interact directly with representatives of companies. Includes a trade show event or outdoor events. An international term for trade show or expo. European term for an area made up of one or more standard units of exhibit space. Exhibiting companies erect trade show displays within the fair stand space. A map showing the size and locations of exhibit spaces. Flooring Trade show flooring such as carpet or other materials that go under the booth display. Rigid foam covered with heavy paper used to mount trade show display graphics. Portable displays, usually a table top trade show booth, that fold for packing in carry bags. The designated time in which all trade show exhibit properties must be removed from the exhibit hall. Trade show freight that is left after the force out time. Forced freight usually gets transferred to the freight carrier designated by show management. An accessory for pop up trade show booths which provides a raised base to add custom features, such as monitor mounts, product pedestals and counters with storage. A European term for a Custom Display, Custom Stand or Custom Build Stand. Exhibit properties and other materials shipped to a trade show for an exhibit booth. A transportation company that performs shipping for trade show displays. Show management appointed company providing services to a trade show and/or its exhibitors. A prominent component of a trade show booth which features the exhibitor's logo and company name. The process of printing large-format display graphics for trade show exhibits. Trade show exhibits that are constructed with eco friendly, recycled and/or recyclable materials. Green Displays are becoming more popular as businesses look for ways to fulfill green initiatives. A trade show event or meetings which adhere to standards to reduce waste and energy usage and recycle show materials in order to lower their carbon footprints and reduce damage to the environment. Overhead structures often constructed from lightweight aluminum tubing and fabric exhibit graphics printed with marketing messages. Hanging trade show displays come in many shapes and sizes. An exhibit booth comprised of more than one type of display system. For example, a fabric display combined with aluminum display walls. I&D refers to the installation and dismantle of trade show exhibits. Also known as set-up and tear-down. The process of preparing outbound and inbound freight shipments for trade show exhibit properties. An exhibit constructed in a continuous line along an aisle. Also called a Linear Display or Linear Stand, in European terms. The process of setting up exhibits according to specifications. Also called Assembly or Set-up. In Europe, Installation is known as Build Up. The set-up and tear-down of trade show exhibits. Also called I&D. A lightweight aluminum frame system covered with either fabric panels or large-format photomural display graphics. An American manufacturer of truss display systems. Small segments of trade show flooring that fit together like a puzzle to create a larger floor. A trade show booth display with aisles on four sides. A common size is a 20x20 island display. An Island Booth is called an Island Site at European fairs and expositions. An American manufacturer of custom modular booth systems using aluminum frames. Contracted workers who perform services. The process of bonding two or more substances together. Trade show booth graphics are usually laminated with a clear, plastic coating to protect the printed paper. Requires expertise in design and production of big-scale trade show exhibit graphics. An enclosed frame which houses lights underneath a translucent display graphic. Provides a back-light effect. A black and white engineered drawing of a trade show exhibit. An exhibit constructed in a continuous line along an aisle. Also called Inline Booth or Linear Stand. A European designed custom modular display system using square plastic panels and small nodes. Covered with vinyl display graphics. Small, portable and lightweight displays made from metal or mesh with pockets to hold marketing collateral. Also called Literature Rack or Brochure Stand. The planning, implementation and coordination of the details of exhibiting at a trade show. Usually refers to trade show shipping, booth set-up and take-down and exhibit booth storage. Custom designed letters or images inserted or applied to the surface of trade show flooring. A custom modular display system constructed with aluminum extrusion posts featuring large-format trade show display graphics. Trade show exhibits built from large, internally-lit display frames infilled with lightweight, fabric display graphics. Often used to create a large island display, 20x20 and larger. Also called Drayage or the movement of exhibit properties by show management between the receiving dock and the booth space. An exhibit constructed with interchangeable components designed to set up in various arrangements and sizes. In Europe, a trade show modular booth is called a Modular Stand. Available in many sizes from a 10 x 10 booth, to 10x20 exhibit up to a 20x20 exhibit and larger island displays. An international term for modular display or modular exhibit. A metal bracket used to hang a computer monitor or TV screen on a trade show booth panel. Also called a Double Deck Exhibit or two-story exhibits. An American manufacturer of custom modular displays and custom portable trade show exhibit systems. Meetings, conferences, seminars and other promotional events which do not include a trade show or expo with exhibit booth space. See also Outdoor Events. A European term for a Corner Booth. A European term for a Peninsula Booth. Special events which occur outdoors. Outdoor events include sporting events, races and other special events. These outdoor events require special outdoor graphics that withstand the weather. Large format banner display graphics printed on durable paper, fabric or other weather-resistant materials with special inks that withstand the elements. Work performed by I&D labor after business hours, on weekends or holidays to set up and take down trade show exhibit booths. Premium service rates apply. A prefabricated trade show exhibit composed of connected rectangular panels of various sizes. See Lite Displays. A small trade show display counter used to display products. An exhibit booth with aisles on three sides. In Europe, a Peninsula Booth is also called a Peninsula Stand or Open 3 Sides. A booth space on the outside wall of the trade show exhibit hall. Large-format display graphics panels of standard sizes installed side-by-side to make a larger image. Often used with Popup Trade Show Displays. The Pantone Matching System (PMS) is used to create consistent colors across various printed marketing materials, such as brochures, flyers, business cards and trade show display graphics. A "point of purchase" promotional display structure used in retail environments to sell products for immediate purchase. Also called Trade Show & Retail Kiosks or a Promotional Display. Add-ons to pop up trade show booths which provide extra functionality. Common pop up trade show booth accessories are shelves, monitor mounts, graphic headers, lightboxes and display counters. A pop up display frame which expands to form the structure of a backwall display and contracts for easy packing into shipping cases. 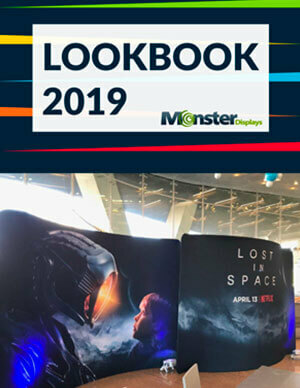 Popup Trade Show Displays often feature large photomural booth graphics. Lightweight displays designed to be compact and pack into small shipping cases that can be transported by one person or shipped via FedEx or UPS. An international term for a portable trade show exhibit or portable trade show booth displays. A common trade show display accessory. A trade show display graphic header which extends above the top of the exhibit booth. "Point of purchase" or POP display racks used in retail environments to sell products for immediate purchase. Also called Trade Show & Retail Kiosks or POP Display Racks. Commonly known by many names, this portable printed graphic unwinds from a base unit and hooks onto a pole to create a standing banner display. Pull Up Banners are available in various heights and widths and fabric quality depending on its intended use for indoor or outdoor signage. Also called Retractable Banner Stands or Large Format Banner Stands. PUNTO is an exceptional die-cut banner stand to enhance brand visibility. This visual marketing display can adapt to the most demanding shape or design, to create unique detailed outlines. Craft out-of-the-box solutions, without the square limits of traditional banner structures. A technique of using a light source to light up translucent display graphics from behind. Also called Back-lighting. A color, two-dimensional drawing of an exhibit booth during the exhibit design process. Complete exhibit rental packages provided by a rental display company to exhibitors. In Europe, a Rental Exhibit is called a Rental Stand. Trade show exhibits owned by an exhibit house and rented out to exhibitors for event marketing and use at a trade show event. The degree of sharpness of a computer-generated image as measured by the number of dots per inch (DPI) in trade show booth graphics. A promotional display structure used in retail stores and shops to sell products for purchase. Also called POP Display Racks and Promotional Display. See also Display Kiosk. A printed graphic which unwinds from a base unit and hooks onto a pole to create a standing banner display. Retractable Banner Stands are available in various heights and widths. Also called Pull Up Banners. Also called a Double Deck Exhibit or multi-level exhibit. An educational program often associated with a trade show event and conferences. The location at which exhibitors order services from show management for their trade show exhibits. The process of erecting an exhibit at a trade show event. Also called Assembly or Installation. Diagrams of the exhibit with assembly instructions. Used by the exhibit labor crews to set-up and tear-down the booth. Shipping Case	Container made from plastic or other materials to store and transport trade show exhibits. A large wooden container used to store and transport exhibit booth materials. Time specified for the closing of a trade show and the beginning of booth dismantle. The area(s) within a convention center where exhibits are located. Also called Exhibit Hall. A hand-drawn concept for a trade show display at the beginning of the exhibit booth design process. Trade show display graphics which are raised off the display wall surface by several inches to add dimension. Keeping exhibit properties in a warehouse facility until needed. Exhibit houses provide storage for trade show displays. Work performed by I&D labor during normal work hours at the standard rate to set up and take down trade show exhibit booths. A person in charge of the labor crew who directs the installation and dismantle of a booth. A fabric covering which drapes over a table, often paired with a table top trade show booth. May have a printed or silk-screened logo. Also called a Table Throw Cover. A small exhibit which fits on top of a table, usually 6 or 8 feet wide. Popup Trade Show Displays and Folding Displays are types of a table top trade show booth. The dismantling of a trade show exhibit. Also called Dismantle. A tall trade show exhibit structure, often used to store an exhibitor's products or other show materials. Also elevates the exhibitor's logo or display graphics so attendees can see and locate the exhibit booth more easily. Widely used international term for a trade show or exposition. An exposition related to a particular industry or group and open only to the members of that group. Also called a Fair in Europe. Chairs, tables and other furniture designed to be compact and pack flat, if possible, for ease of shipping trade show exhibit materials. Use of expositions related to a particular industry or group at which customers interact directly with representatives of companies. Also called Event Marketing and involves use of a trade show exhibit. Goals set by exhibitors to achieve through trade show marketing. Booth design is directly related to a trade show exhibitor's objectives. European term for an area made up of one or more standard units of exhibit space. Exhibiting companies erect trade show displays within the trade show stand space. The movement of visitors through an exposition or trade show exhibit. A Truss Trade Show Display is constructed from lightweight aluminum and provides a modern, industrial look to an exhibit booth. Often paired with Fabric Display Graphics. A Truss Display can be can also be used to hang lighting or other equipment above a booth. The trade name for a fabric closure with two components: hooks and loops. The two components adhere when pressed together and separate when pulled apart, allowing for repeated use. Often used to attach trade show display graphics to the booth. Cut letters and logos from a thin, plastic materials that adheres to trade show exhibit panels, similar to a sticker. A European term for a person who attends a trade show or trade fair. Also called Attendee. A clear plastic sheeting that is placed over trade show flooring after it's laid in order to protect it until the show opens. Storage of exhibit properties when not in use. A small structure within a trade show exhibit, which often features a computer kiosk with multimedia capabilities. Also called Display Kiosks. Fabric displays in which fabric exhibit graphics of similar or different sizes weave and twist through a pop up display frame.